Desh Bhagat University’s Faculty of Hotel Management and Tourism, Director, Amit Sachdeva has been honoured with ‘Star Donor Award’ for his distinguish contribution for the service of Humanity. 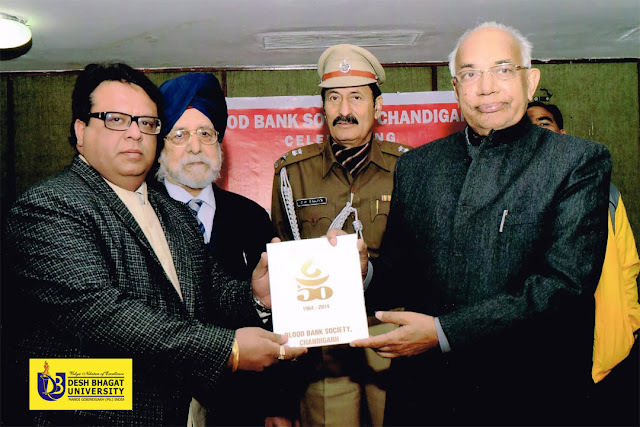 The award was given to Mr. Amit Sachdeva by Honourable Governor of Haryana, Prof. Kirpal Singh Solanki, at Haryana Raj Bhawan, Chandigarh at a special function held by Blood Bank Society of Chandigarh. It’s worth mentioning that Mr. Amit Sachdeva is a regular blood donor and he has donated blood for more than 79 times. The function was specially arranged by Blood Bank Society of Chandigarh on its 50th Anniversary, to honour those Star donors, who have donated blood more than 50 times, frequently donating blood and inspiring others to do so. Eminent personalities from different fields were also present on this occasion. Desh Bhagat University Chancellor Dr. Zora Singh and Pro Chancellor Ms. Tejinder Kaur congratulated Mr. Amit Sachdeva and said that this award is the result of his dedication and exemplary services to the society. They wished that everyone, especially the students will get inspiration from his long and exemplary work for humanity that will inculcate an attitude of “giving” & not “taking” amongst students of DBU. University VC and Registrar along with other faculties also complimented Mr. Amit Sachdeva for this honour, hoping that he will continue to contribute to this noble cause in future also.